Prepare your house and garden for the onset of winter, but don't let October pass without enjoying fall's pleasures. If the calendar hasn’t convinced you of autumn’s arrival, the cooler temps and falling leaves no doubt have. It won’t be long before the thermostat will need to be inched up, and the lawn furniture will have to get cleaned, covered, and stored for the winter. This is the month to finish your Fall Home Maintenance checklist (and even tackle some weekend projects). But don’t let the time pass without enjoying the simple pleasures of the season, from leaf peeping and apple picking to every kid’s favorite—Halloween. Here are my 5 “Must Do” Projects for October. Since the cost of heating accounts for nearly 50% of your home’s energy costs, it’s important to do everything you can to make certain that your home is weathertight and that your furnace is operating at peak performance. In short, reduce home heating costs. Sealing drafts around windows and doors and installing sufficient insulation, particularly in the attic, are two economical ways to keep your indoor temperatures and energy costs in line. Having your heating system checked by a licensed contractor is a smart fall habit. Heating system, no matter the fuel, will work more efficiently, last longer, and have fewer problems if properly serviced. At the very least, make certain the filter is cleaned or replaced. If you have a wood- or gas-burning fireplace, insert, or stove, make certain it is in good working condition. Examine door gaskets for a tight seal, inspect the glass for cracks, and if the unit is equipped with a blower, make sure the unit is clean and operating smoothly. If you have a wood-burning fireplace, be sure to have the chimney cleaned by a professional. Lastly, put your ceiling fan to work year-round. By changing the direction of your fan in the winter, you can recirculate the warm air near the ceiling to where it is needed most. Don’t have a ceiling fan? You’re likely to find a great end-of-season bargain in stores now. For gardeners in areas where the weather has cooled, it’s time to plant bulbs for spring tulips and daffodils. Bulbs are nature’s perfect packages, having all they need to grow inside. All they require is a bright, sunny location and a little soil preparation. The best blooms start with loose soil and a few inches of well-aged compost mixed in. Tulips and daffodils should go in six inches deep and six inches apart. Remember to examine the bulbs before tucking them in—don’t bother using ones that feel squishy or dried out. You can plant through the last week of November, although some gardeners don’t stop until the ground is completely frozen! This is a great time to tackle a weekend project. 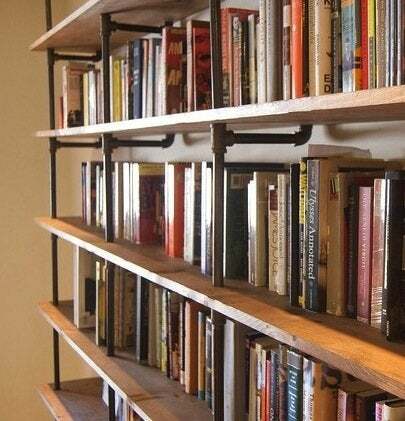 Since adequate storage is every homeowner’s biggest complaint, consider building a bookshelf. It is one of the most basic DIY projects imaginable, and one that offers the greatest flexibility in terms of design, materials, tools and level of skill. We discovered 5 “Make in a Weekend” Bookshelf Projects constructed of everything from pipe fittings and cinder blocks to shipping pallets. And if you happen to be in possession of a shipping palette or two, there are many other ways to upcycle them into innovative desks, daybeds, plate racks, kitchen islands and more. This is the month to drain fuel from all gas-operated equipment, such as lawn mowers, leaf blowers, and chain saws. Cover and store outdoor furniture and barbecues in a protected area. Make sure all soil is emptied from pots, containers, and planters (dirt left in clay pots outside will freeze and cause the pots to crack). Disconnect and store garden hoses. If your home has a separate shut-off for external faucets, turn it off and drain the water from those faucets. If you have a sprinkler system, you may want to call in a professional company to blow out any leftover water in the underground lines. Finally, check to see that all of your snow equipment is close at hand and ready to be put into service. That includes snow blowers as well as shovels and roof rakes. In addition to figuring out the scariest, coolest, or most innovative costume for Halloween, this is the time to get creative with some pumpkin carving DIY. Have fun experimenting with concepts and techniques, from drilling and etching to stenciling and old-fashioned carving. Not only is this a great family endeavor, it’s a good way to familiarize the kids with basic tools and safety. And remember, even a pumpkin in its natural state can add some beautiful seasonal decoration to a front porch or mantel.